I’m grateful that I had the opportunity to care for my grandmother, which helped her age in place and manage her home. I love that InnovAge allows me to continue helping other seniors stay in their homes and sustain their independence. James Sawyer serves as executive director for InnovAge’s Blue Ridge PACE center in Charlottesville, Virginia. James has spent over 20 years working in the healthcare field, with extensive experience providing care to seniors and those with developmental disabilities. Previously, James served as a center director for LIFE programs in Pennsylvania, where he provided operational oversight and worked to increase the number of participants in the program. 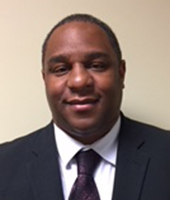 James received his MSW from Temple University, his MBA from Eastern University, and is currently pursuing a master’s degree in healthcare administration. Outside of InnovAge, James sits on the board of directors for several organizations in both Pennsylvania and Virginia.